Join the discussion on our forums! Come discuss Crystalsong Portal over in our dedicated Crystalsong Portal discussion topic. Discover a Druid minion. If your hand has no minions, keep all 3. Incredible. Playing token its so easy to trigger too. I've won games against control I should,ve lost with this. Amazing card. I don't know how could most of the people miss just how strong this card is. Most slept on card of the expansion imo. Basically Master's call for low to the ground/ spell focused druid decks. I've been grinding a lot with druid, and it's a card I always I want to see when I run out of gas. 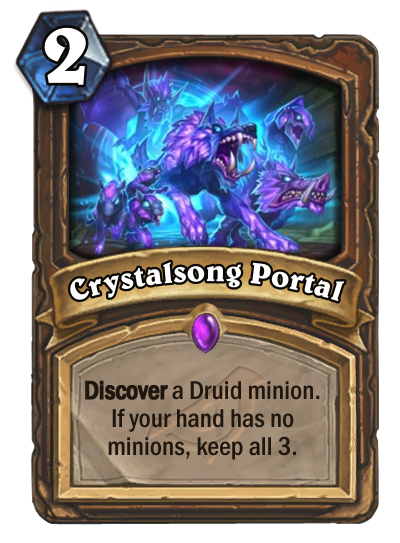 This card is incredibly good for token druid in wild, you play your minions early and instead of running out of cards you play 2-mana "draw" 3 minions.